The first adventure of many! I grew up reading murder mysteries and thrillers, and by that I mean I devoured everything my mom placed in my hands between ages 10 and 18. Since she was a mystery/thriller buff, so was I. One of the series I adored was Elizabeth Peters’ Amelia Peabody adventures. (A close second to Peabody: the Vicky Bliss books). 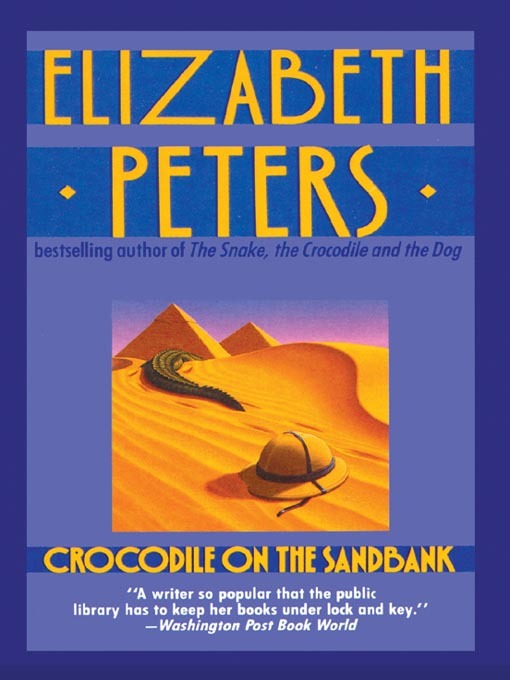 The first book, Crocodile on the Sandbank, came out in 1975. My introduction to the series was the ninth book, however, Seeing a Large Cat, which came out in 1997. My mom picked it up through one of those mail-order book clubs. You know, the kind where you can get a dozen books practically free as long as you buy a book a month for a few months. You know, causing you to join the club, buy the minimum number of books, quit the club, and then join again to start the process over, cackling into the sunset with all your cheap loot. Anyway, Seeing a Large Cat. I read it because there was an Egyptian cat on the cover. I was promptly very confused about the ongoing character relationships and footnoted references to past adventures. In particular, I thought Amelia’s husband Emerson shouted too much and I didn’t understand why they were together. So I went back to the beginning of the series and fell in love with everybody and everything. These are turn-of-the-century Egyptology-themed mysteries, headed by an eminently practical protagonist. The series spans the years 1884 through 1923, Amelia from age 32 through 71. There is something I absolutely adore about practical, middle-aged heroines. She gets love without the angst. She solves problems using her head– as opposed to the usual methodology of fictional female investigators, aka being kidnapped by the villain. Amelia goes into blackout rages to protect her trouble-making son, foils the antics of a master antiquities thief, and carries around a steel-tipped parasol– just in case. Oh, and Egyptology. This series is the reason I named my first cat Bastet, and the reason I will have to resist naming my own son Ramses. Last week I was nervously re-reading the book after having talked my book club into it. Nervous because I hadn’t read it in about 15 years, and I have had very mixed results re-reading books I loved in junior high and high school. What a relief, then, to still adore it! I never quite finished the series. The later books dealt more with the younger, but now grown-up, cast members, and some of the love-stricken angst had crept in that I was so pleased to see absent with Amelia and Emerson. Now I’m back on the horse though, and I’m considering working my way back through the series. I at least have to re-read the third book, The Mummy Case, which was by such great means my favorite I think I even read the whole thing out loud to my brother.